Belgium M 1893 NCO bayonet without mortise slot and press catch. 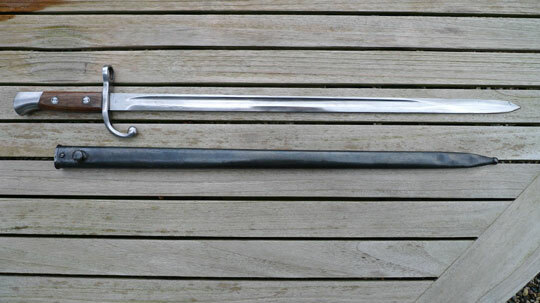 Beautiful very long bright polished fullered straight blade with Belgium inspection mark on ricasso; crown over FL. Bright polished pommel without mortise slot and press catch. Tiny little inspection mark on the left side of the pommel.Hilt, crossguard and pommel are made out of one piece of steel. Bright polished crossguard with a faint serial number, a muzzle ring MRD 17,5 mm. and a forward swept quillon with final. Excellent wooden grips secured to the tang by screw bolts. Blued metal scabbard shows wear and light pitting on the troath and a few shallow dents near the tip. Extremly rare side arm isued in a very limited number to NCO's without rifles and not to bandsmen!